She's got her cleats, shin guards, and will be wearing good ol' #7 on her back... I am so excited that Elise will be playing in her first soccer game this Saturday! I started playing soccer when I was 4, and played all the way up until I found out I was pregnant with Elise. The only time I took a break was when I had to have both femurs broken (not at the same time) when I was 15. And now my little girl is following in my foot steps! The funny thing is, her shirt colour is orange, and so was mine when I was her age. Of course I am pretty nervous about wrangling her blood sugars during the game (they have a 30 minute practice followed by a 30 minute, 3 on 3 game). Especially without the dex. Plus, Fred can't make her first game, so I'll also be chasing Mattias around too. Blergh. I'm wondering if anyone has tips on pre-carbing/temp basaling. What would a good pre-game breakfast be (the game is at 10:30)? Any other tips would be most welcome! I don't have a pic of Elise all gussied up in her uniform, but I did find one from my early years... note how I am rockin' the bowl cut! If you ask really nicely, I'll share some of my track photos... in which I am wearing spandex. You know you want to see that! omg you are adorable!! and yes...i would love to see the track pics too...LOL! I have to ask about the femurs? ouch! Also, what I do for Emma with her 2 hour gymnastics class which a bit different time of day than Elise's soccer...it's from 1:45-3:45 so not sure if this will help? Anyway, I give her a granola bar for snack before hand and only bolus for half of it if her BG is in range at that point...if it's on the lower end I won't bolus at all. Then I set a -20% temp basal for the full 2 hours. She also has a break half way through and I give her a bit of fruit (clementine, berries, etc) and handle bolus the same as before. It works well most of the time. Good luck!! We always start gym, swimming, any exercise with a 180 blood sugar; test an hour in to the game and give more carbs to keep bs up to about that level (she drops more than many with exercise, according to our first school nurse). We used to do minus 70 percent but soccer and softball, they are not always as active the whole time. We do minus 70 for gym. I would say keep the sugar up to start, set the same temp basal you set for exercise generally. Then at the one hour mark, test and you will see how much she drops from that 180 blood sugar. I would be more aggressive with the minus temp the first time. She'll do fine! It's swimming and trampoline that I fear. My sister had the same cut. And big old blush pink glasses to go with it. Anyways, always do a low carb breakfast like eggs, and bacon. I'm not like Elise BG wise, but I always have to over correct for carbs, like instead of 5 carbs, do 10 or 15. How she reacts to that, I'm not sure. But also, about an hour after the game, she will sky-rocket to about 300-400, trust me, I speak from experiance. Again, I'm not sure how her blood sugars would react to that, but that happens, and did happen to me. Tell her good luck, and you were rockin' that bowl~cut!!! anon comment above is my kid. i was waiting for my husband to come home so he could give you some advice (he's been coaching her for 8 years) but she just told me left you a comment already. Hope everything went well and Elise enjoyed her first game! 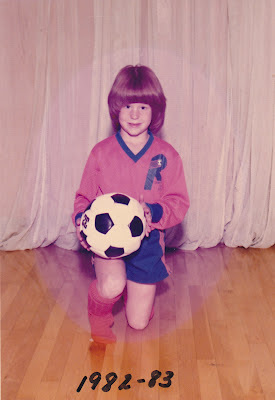 Very few people can 'rock the bowl cut' or, as my hair was styled at a similiar age . . . the Dorothy Hammil cut. My hair is thick and has just enough curl to pull off the look to perfection. It is nice to see another little girl who wore that style with moxie. Love 'little' you! So stinkin cute!! We try to have Ava start her activities around 180 as well. For morning sports that means backing off a bit on the breakfast bolus. Definitely include some protein with carbs for breakfast. Waffle and scrambled eggs? Temp basal will be trial and error. We go -60% for snow skiing. Soccer I might start with -40% and see where she gets to. She might also need a little uncovered snack between drills and game. This year we have Ava check her bg at halftime and call us on her cell phone with the # and for eating instructions. Ava has been skiing and doing PE with just a regular pod. For soccer she might wear Bands for Life to keep it snug and not bouncy. Have fun!